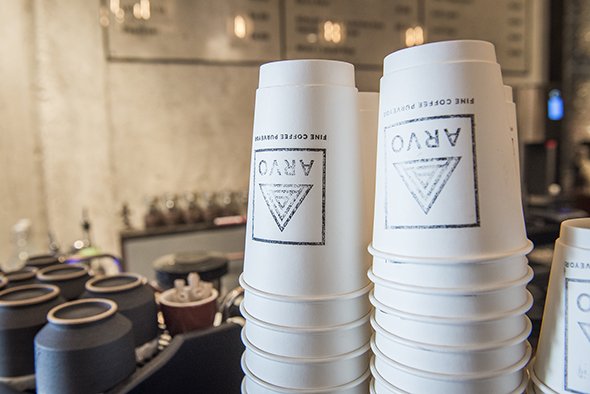 Arvo Coffee is a Distillery District cafe, one of the few places beyond Balzac's to get a coffee in the historic industrial area. 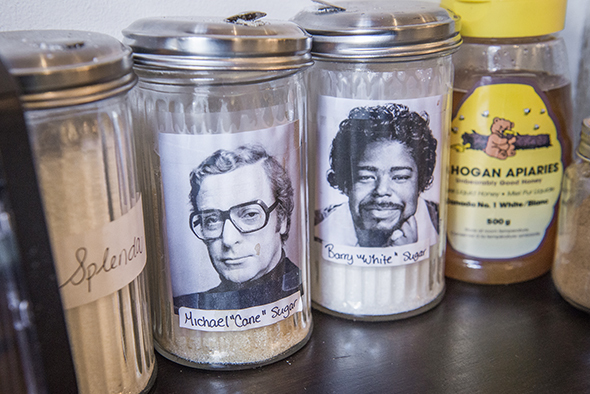 They set themselves apart by being a combination coffee and flower shop. 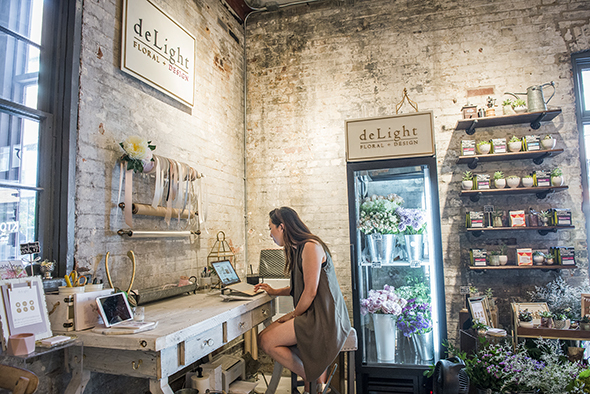 Both business work organically in harmony together, deLight's floral arrangements and Arvo's coffee providing both beautiful fragrances and treats for the eye. Justin heads up the coffee part of things, and his wife is a wedding planner, which is how they met Sarah, the florist who runs deLight. They worked together on weddings, and it was Justin's dream to open a coffee shop after wandering about Australia where friends would often ask him, "Hey man, meet for a coffee in the arvo?" Arvo is Aussie slang for afternoon. When they found out this space in the Distillery was available, the team decided to set up shop. 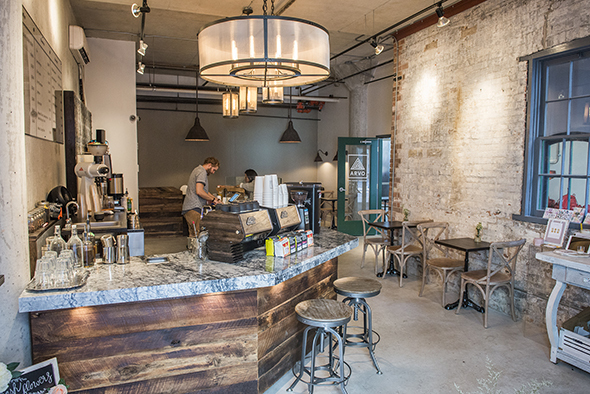 The spot was formerly used for retail offices, chunked into little sections. Arvo blew all that away into an open concept design, with exposed brick and a mobile bar that can be rolled out onto the patio. They primarily use Phil and Sebastian coffee, roasters from Calgary. 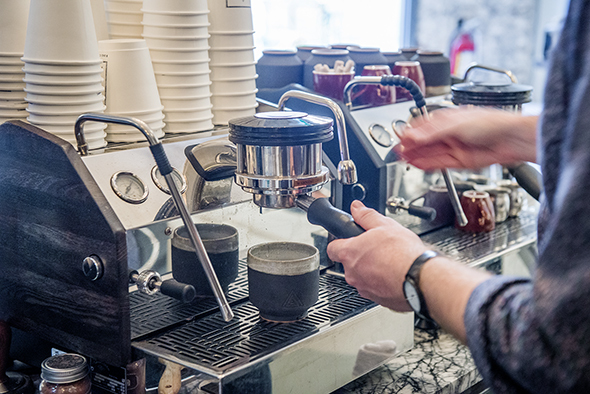 They chose their beans because they say Phil and Sebastian are the most transparent about the hands that actually produce the coffee, every step of the way. They also brew Transcend , which is from Edmonton. 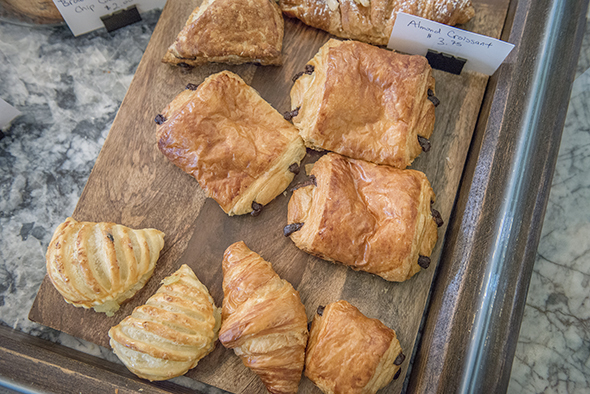 Baked goods are outsourced from Delysees , such as chocolate croissants ($3.25). They also serve "li'l" pastries that are well-suited for kids, like a li'l apple turnover ($2). It's a smart move with a daycare next door. 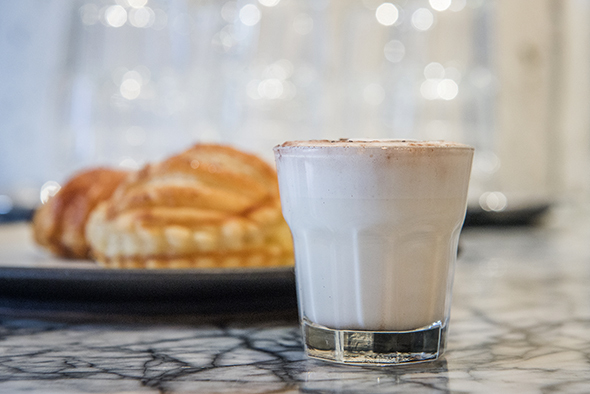 They also offer complimentary "baby cinos" made with steamed milk and cocoa powder so kids can have a cuppa along with their parents. For $4 I try a simple latte. 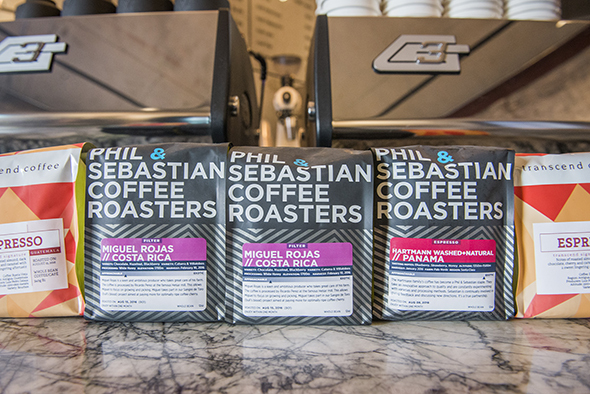 It's Phil and Sebastian's Panama blend, made with half-washed natural beans. Most beans are "fully washed" meaning the outer shell has been completely removed. Leaving a little skin on "half washed" beans creates natural fermentation by releasing more sugars inside the fruit. It's also made with whole Quebec milk. They also have a Silverton pour over setup. 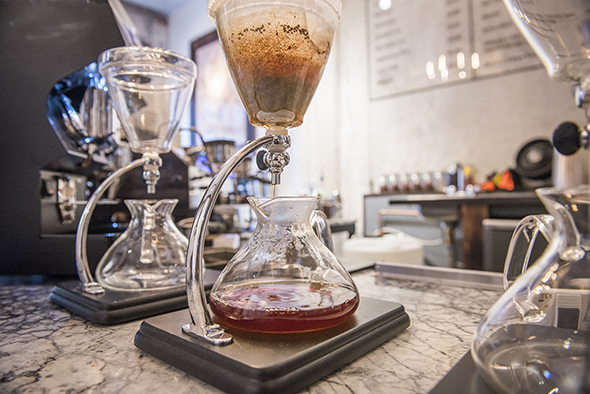 It's something I hadn't seen before, basically a cross between a French press and a Chemex. 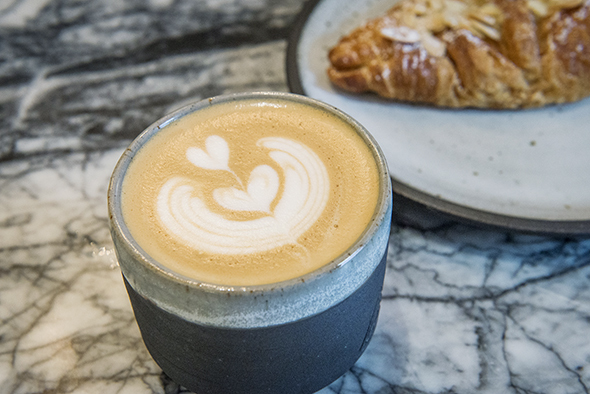 It's from Japan, and apparently highlights more exotic blends of coffee, like an Ethiopian blend with notes of watermelon and passion fruit we try. The spectacle of glass is enticing, but you'll have to wait four minutes for the final product. Little arrangements by Sarah dot the cafe. 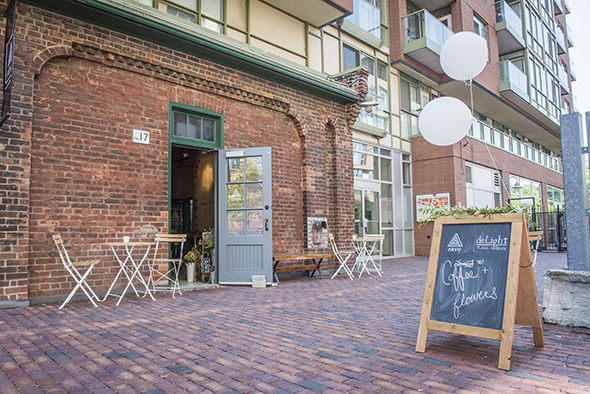 They're the only florist in the Distillery, and sell succulents ($14 - $22) and bouquets ($12 - $35). Of course, she's also happy to do custom orders and events.